Securidaca longepedunculata Fers (Polygalaceae) is commonly used as a traditional medicine in many parts of Africa as well as against a number of invertebrate pests, including insects infesting stored grain. The present study showed that S. longepedunculata root powder, its methanol extract, and the main volatile component, methyl salicylate, exhibit repellent and toxic properties to Sitophilus zeamais adults. Adult S. zeamais that were given a choice between untreated maize and maize treated with root powder, extract, or synthetic methyl salicylate in a four-way choice olfactometer significantly preferred the control maize. Methyl salicylate vapor also had a dose-dependant fumigant effect against S. zeamais, Rhyzopertha dominica, and Prostephanus truncates, with a LD100 achieved with a 60 μl dose in a 1-l container against all three insect species after 24 hr of exposure. Probit analyses estimated LD50 values between 34 and 36 μl (95% CI) for all insect species. 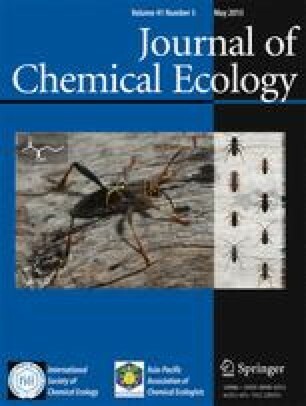 Furthermore, prolonged exposure for 6 days showed that lower amounts (30 μl) of methyl salicylate vapor were able to induce 100% adult mortality of the three insect species. The implications are discussed in the context of improving stored product pest control by small-scale subsistence farmers in Africa. Securidacalongepedunculata Polygalaceae methyl 2-hydroxybenzoate methyl salicylate olfactometer fumigant toxicity Sitophiluszeamais Rhyzoperthadominica Prostephanustruncatus.